Round out your game room or man cave's entertainment with the Redline Single Shootout Arcade Basketball. Play solo or go head-to-head with a friend as the electronic score board tallies up points and a timer counts down. The frame of this unit is constructed from 7/8-inch steel tubing for sturdiness. Need a little extra room? The frame folds down for storage when not in use. Nylon netting and bottom round out the design. 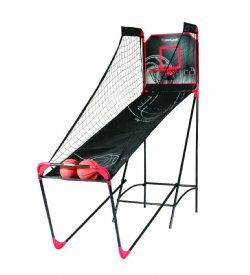 Two mini basketballs and a hand-pump are also included. This arcade-style basketball game is ideal for kids and grown-ups alike. About Escalade Sports Escalade Sports originated as Indian Archer and Toy Company in 1927. Since then, the company has blossomed into an internationally acclaimed sporting goods manufacturer and distributer. As the world's leading producer and distributer of pool tables, table tennis tables, and game tables, Escalade Sports is known for their quality products and brands, new product development, and excellent customer service. Headquartered in Evansville, Illinois, this global company can confidently say that no matter what your game, their brands deliver serious play. Frame is made of steel tubing. Designed specifically for home use. 1 – 2 player electronic scoring & time clock. Folds easily to save space when not in use. Manufacturer's 90-day warranty. Shipping charges within the 48 contiguous states via Fedex or UPS Ground are included in the price below. Please read our shipping policy for full details.